This lovely desk has served us well, but now must be part of our clearance sale! The top surface and drawer faces are a dark walnut, and the body is black lacquered. The desk has a pleasing curved shape, making it wider in the front, and narrower in the rear. There are inset bookcases on the front side of the desk. The drawer and door handles are a streamlined solid brass. There are two moderne keys included, which lock the two bottom drawers and the cabinet door. The top surface also has a glass top, not pictured. The desk has an older re-finish, and shows minor signs of wear. 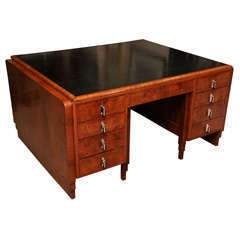 Original French Art Deco Desk with seven drawers Black piano lacquer Middle drawer with key lock Three drawers on the left and on the right side Nickeled metal fittings. 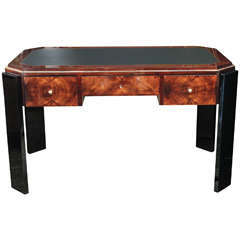 Original French Art Deco desk with five thin drawers High gloss black piano lacquer Nickeled metal fittings and sabots.